Prompted by Chantal Florin’s recent MA-XIII tangle inspired by a cathedral, CZT Kathy Barringer sent along this beautiful tangle also Cathedral-inspired. If you’re from the Albany NY area, visit Kathy’s website to learn about the classes she offers. 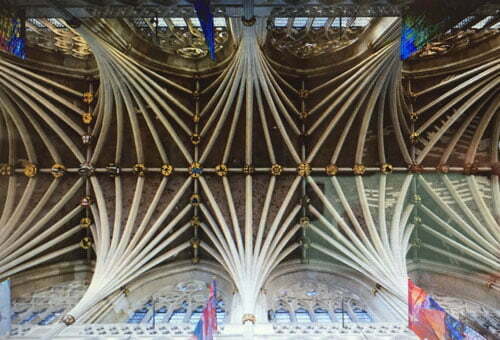 This is the awesome ceiling that inspired Kathy’s Cathedral. You’ll notice that the medallions (“bosses” – we learn) where the ceiling’s ribs meet become a prominent feature in Kathy’s tangle. 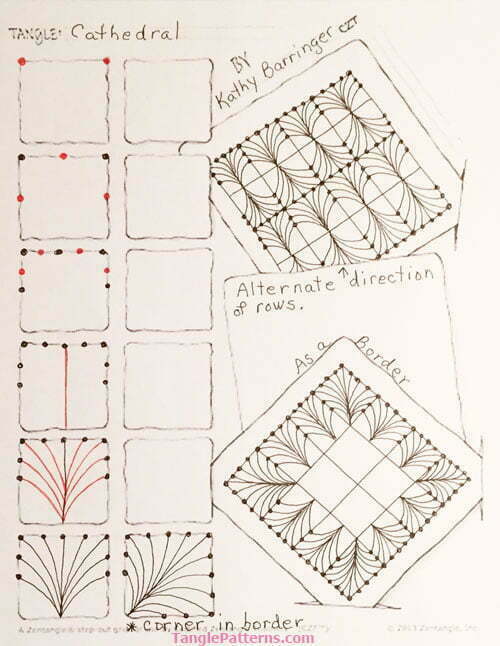 Here are Kathy’s step-by-step instructions for drawing Cathedral. It’s very easy to draw, but trust me it requires your full focus. Kathy shows how to “turn the corner” when using Cathedral as a frame or border. 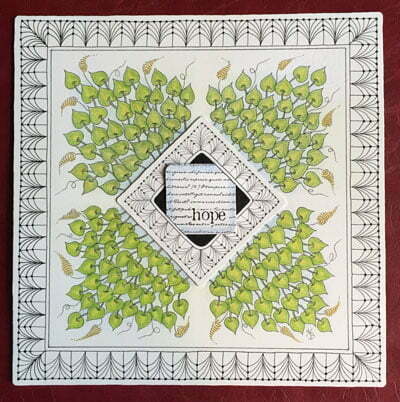 Kathy’s very pretty Opus tile features Cathedral as a border together with the Zentangle®-original tangles Pokeleaf and Zinger. CZT Kathy Barringer, I’m LOVING your Tangle “Cathedral!” Thank you. Love this…so pretty and delicate! This is beautiful and I hope I can make it look so wonderful as you do. Thank you so much. What a beautiful tangle, and an even more beautiful inspiration! Thank you for sharing your gifts with us. This tangle is going to be wonderful to work with. Thanks so much for this wonderful tangle. I love it, too! A lovely tangle and a great inspiration. Exeter is our local cathedral and I have visited it many, many times. It is very beautiful. Very pretty. Light and airy. Its easy to draw. Thanks for sharing. I simply Adore this tangle!! Thank You So Very Much!! I can tell this is one I’m going to use a lot. Lovely. « Tangle Refresher 127 – Featuring some excellent online guides to gel pens, calligraphy pens, drawing inks … and more!